Once again, this popular meeting came and went so quickly this year that it often seems as if we have dreamed it, but I am sure that many will agree with me when I say that this year’s get together was probably the best yet, and certainly one of the best attended. One thing that is always clear to members is the sheer hard work that organiser Stan Benton has put into the day. No fewer than five collections were on display this year with old favourite, Mark Roberts taking centre stage of course, and one or two previously unseen collections this year. 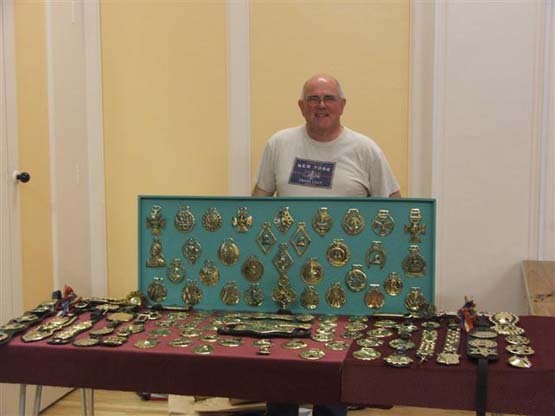 Our Secretary, Steve Pink, brought his collection of nosebands that he likes to specialise in, and Allan Brewer was in attendance again, and his collection is certainly growing. The first of the new collections was that made by Mark Svensson (above), which was pleasingly different in having a distinctly Scottish flavour. 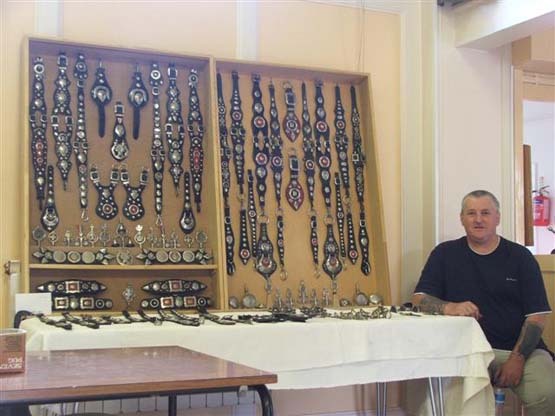 Mark, a saddler from Kent, has kept Clydesdales for a number of years and so his collection favours the Clydesdale style of decoration with high, “Brecham” style collars and the ornamentation being mainly white brass. Mark came a long way for today’s meeting so well done Mark, and we hope to see you again next year. Alan Field (above) also travels long distance coming from Sussex and he brought some of his collection for us to look at today. 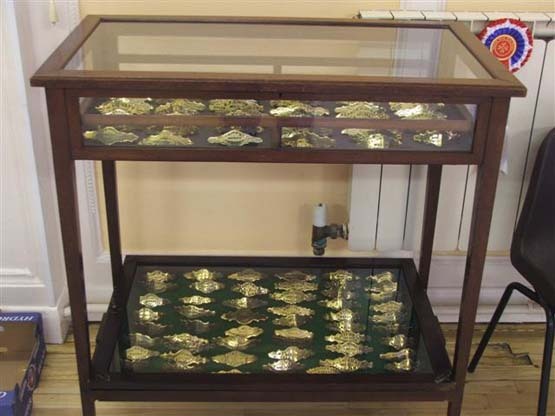 It is always nice to see good quality items and there is no doubt that his representative brasses here today are all high in quality and are much sought after types, most of which are on our “wish” lists, so well done Alan. 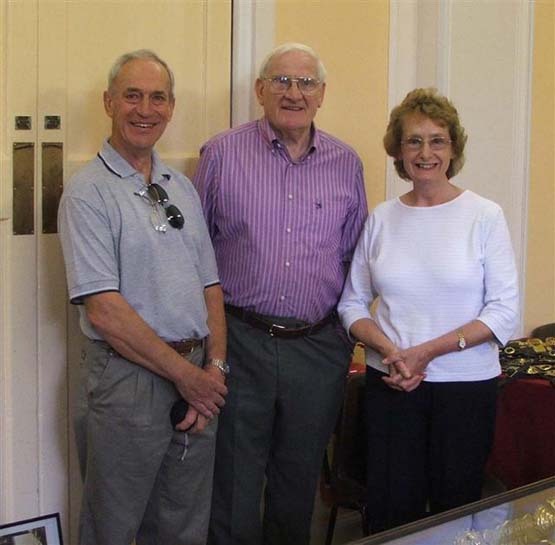 The First Prize for mileage this year however, surely has to go to Jeff Crocker (below photographed here with his wife and Stan Benton, centre) who came all the way from Australia. I do not think it is possible to beat this record and it is always nice to meet with overseas members, so we hope their journey was worthwhile and that they will return home with a few examples that will serve as reminders of the day. As usual, the day was gone all too soon and once the raffle was done and dusted, we set off for home around 4pm, on one of those afternoons that this meeting is famous for. There is certainly something about this meeting that makes the journey worthwhile however far we have to come. Indeed, some of our collectors arrive in the general area a day or two previously and like to take in the heritage sites such as Stokesay Castle and Acton Farm Museum and the general beauty of the area as well as taking a ride around the local antique shops. There is of course a good antique centre in Church Stretton itself and of course, if you are around a day or two previously, then there is also Stan’s shop at No 1 Burway Road in the town. See you all next year! And well done Stan for another great meeting.